← as slow as honey in february…? So these bunnies reminded me to show you a recent thrifty purchase. I’ve wanted some of these Polish dolls for awhile, just never got around to buying any. But my husband and I were at a little antique store we go to occasionally, and I remembered these two, which had been there since our last visit a year ago, so I rescued them. 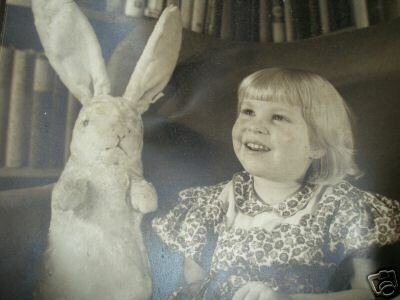 And then, back to ebay and the Steiff bunnies, I found this photo of a girl with a bunny, which then reminded me to show you Clara’s haircut! It’s very 1940s/50s choppy and cute. She was very good, although she was terrified at first. She soon relaxed and was rewarded with a cookie and a wee certificate for her very first haircut. Super cute. 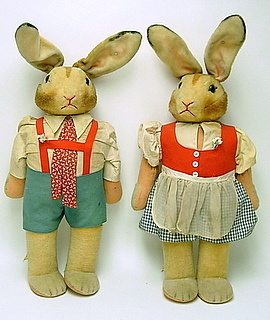 I found two new steiff bunnies at that store Home Goods last year for my urchins’ baskets. They were small but very reasonable. I never go in that store but got lucky when I went in then. so adorable!! The bunnies, but especially Clara’s hair! My hair was like that when I was little, wispy and fine, so Mom always chose that type of cut! Wow, those bunnies are expensive. They’re probably a rare pair. I love the little dolls you found, they’re really cute. Clara is getting so big. She sure doesn’t look like a baby anymore. Darling haircut.